After a harrowing bus ride to get to Rangamati, we were exhausted and checked in to the first hotel that we visited. For dinner, we spotted an outdoor restaurant directly across the street where, after sampling the deep fried paratha bread stuffed with egg, we ate every night. After a few meals, the kitchen staff knew us (I admit we were somewhat recognizable) and would send over the "English speaking" waiter to serve us. Our hotel was slightly more upscale than what we are used to, we met many Bangladeshi families vacationing ... we posed in a few family photos. I enjoyed the hotel even more once I convinced Yann to move into an air-conditioned room. We spent quite a few hours hiding from the mid-day heat watching Al-Jazeera coverage of the Iranian elections. Rangamati is actually a series of islands on Kaptai Lake, an artificial lake cause by the Construction of Bangladesh's only hydro-electric project. Some of the main islands are connected by causeways, and others are only reached by boat. We were a causeway away from the centre of town. Getting around was actually fun, once we understood the system. 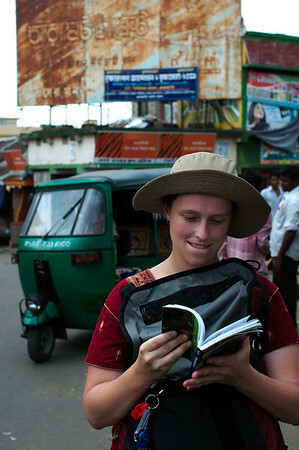 Since the town is actually quite sprawling, it was difficult to walk anywhere, but there were motorized rickshaws abound. The rickshaws operate almost like public buses. They ply the two main roads and pick up and drop off customers. You simply pay a few takas and climb on to the rickshaw with other passengers. It was amazingly efficient, and great for keeping the fare low, as the other passengers intervened if they thought the driver was charging us too much. We ended up going back and forth between the two main docks for almost an entire morning, trying to get someone to let us on a boat. We wanted to take a boat back towards Kaptai, returning to visit some of the villages that we had passed on our bus ride from Bandarban. We first went to the main docking area at the very northern tip of Rangamati's main island. Various boats were docked on the sandy shoreline, with passengers loading onto the boats via thin wooden planks leaning up against the boats. The area was bustling and the boats were completely packed, but apparently none were going in our direction. 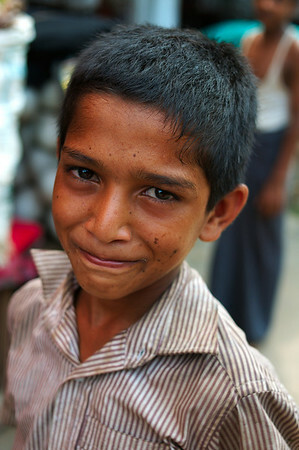 We worried that no one could understand our Bengali. Many people had told us that this was the place to catch a boat to Kaptai, so we were weary of anyone trying to tell us otherwise. That our guidebook's list of scheduled departures from this boat terminal would be accurate now seemed to be more than a little bit optimistic. There was no ticket booth, no signs, certainly no staff member, simply a few shacks along the beach and a few unmarked boats. It seemed that the local system was to hope that your boat would eventually arrive. Of course there was probably more order than was apparent to us, but without a local guide to help us, getting on the correct boat was close to impossible. 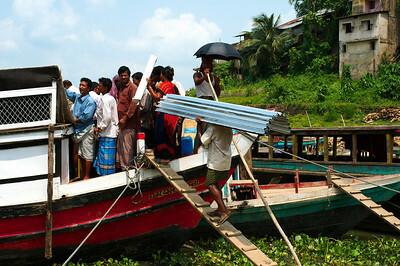 At one point we gave up trying to find a boat to Kaptai and decided to get onto any boat that would take us anywhere. No one would let us on. We had been warned that this might happen, as theoretically our permits were not valid for any travel that strayed too much from the main towns. The boat drivers may have been weary of carrying foreigners to "restricted" areas. Whatever the reason, we spent most of our afternoon inquiring about boat rides for the next day. Everyone tried their best to help us, but not a single person gave us the same instructions. 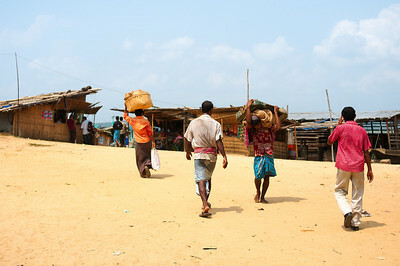 The only person who seemed to maybe have an idea was a young man who spoke a bit of English, he instructed us to go to the other docks across town the next morning, a boat would be leaving for Kaptai the next morning. Searching for a boat took up most of our morning and early afternoon, so for the rest of the day we explored the dried fish market, near the main docks. We were followed by a steady stream of curious locals who wanted to have their photo taken and see themselves in the camera viewfinder. Adults and children were equally giddy at our presence and would usually burst into laughter when we smiled at them. On our second morning in Rangamati, we headed to the docks where the boat to Kaptai was apparently leaving from. Everyone we asked told us that we were in the wrong place and that we had to go to the main boat area (where we had been the day before). As we went from boat to boat being turned down, the young man who had given us the departure information appeared and we quickly questioned him: "where is the boat to Kaptai?". "Oh.... friends, no boat to Kaptai. I give you private boat tour around Rangamati?". What? We had been duped? It had been too long since we had seen other tourists and it seemed we had let our guard down. Luckily, we had pretty much given up hope on getting onto a boat, so we were only mildly pissed off, even though our friend had arranged so that we would miss the actual boat that we wanted to catch. It turned out to be market day in Rangamati and boat loads of people and products were arriving as we stood around explaining to the sneaky boat driver that we would not be taking a private boat tour. 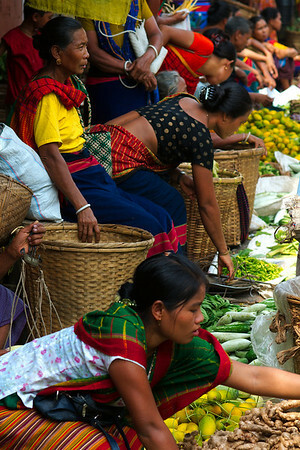 Instead we followed the stream of women in their colourful sarongs into the packed market streets where hundreds of people had already set down their blankets and neatly displayed their fresh produce. The beautiful Chakma women who manned the stalls seemed to smile more than most people we had encountered (maybe this is the reason we remember them as being particularly beautiful). 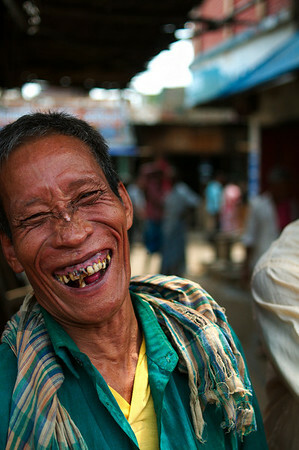 We spent a lovely morning photographing them as they smoked, laughed and sold their fruits and vegetables. 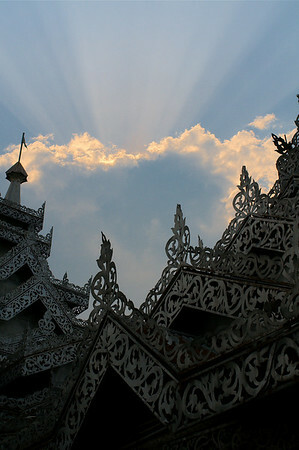 In the afternoon we headed to the largest Buddhist temple complex in the city, Bana Vihara. We ended up there two hours before visiting time was to begin, and we felt that if we returned to our air-conditioned hotel room we might never returned, so we decided to wait it out. We spent at least an hour at a small local tea shop outside the temple gates. The minute we sat down, other shop owners came to see their neighbor's bizarre guests. We ordered tea and we were promptly served along with a plate of soggy cookies. We sat most of the time with a sweet old man, who seemed to be a family member of the tea shop worker. He spoke to us most of the time, in a local language. He didn't seem too worried that we spoke a different one. 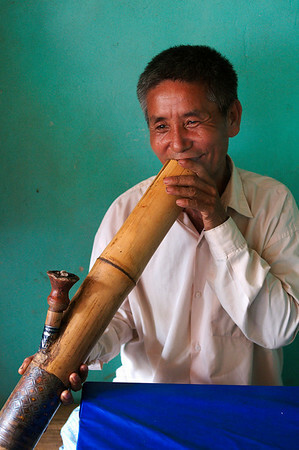 Other family members entered the shop, one smoked a huge bamboo pipe, the others just hung around and had tea. 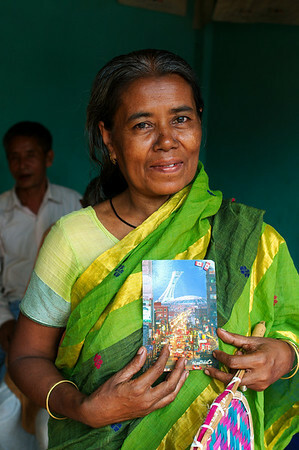 Before returning to the temple we handed out postcards of Montreal which proved to be a huge hit. Little did we know that the Olympic Stadium postcard would be the most coveted. It seemed that locals knew the word "stadium" from cricket, so they cared much more about our stadium then say, the postcards depicting 4 feet of snow.We made note to only hand out the same postcard the next time around so as to not cause the jealousy that was brought on by the stadium postcard. To finish off the day, we watched the sun set over the temple, accompanied by a sweet local student who had seen us entering the temple rather confusedly. He gave us a tour of the complex, explaining each building and even bringing us to the "question period" where locals come to ask the elder monks for answers to their queries. The temple grounds were quiet and peaceful and were just beginning to fill up as we left. After a full day, we finally headed back to our hotel where we crossed the street for our last meal of fried paratha, just one of many pleasures of Rangamati that we would be sad to leave behind. love all your observations. Like I was there.